Rick Sanchez: Jon Stewart Is "Classiest Guy in the World"
Appearing this morning on ABC's "Good Morning America," he told host George Stephanopoulos, "I screwed up, George." Sanchez blamed his "inartful" comments during a radio interview last week on exhaustion. "I was tired, working 14-hour days for two and a half months," Sanchez said. His daughter had a softball game that he wanted to get to, and he was "a little impatient." "I said some things I shouldn't have said, and they were wrong. Not only were they wrong, they were offensive, and people were offended by it," Sanchez said. He added that his words were not what he meant to say. In an interview with satellite radio host Pete Dominick last Thursday, Sanchez suggested that members of the Jewish faith control the TV networks. He also said that Jon Stewart (who had ridiculed Sanchez often in the past) is bigoted toward "everybody else that's not like him." CNN fired Sanchez the next day. "I am very much opposed to hate and intolerance, in any form, and I have frequently spoken out against prejudice. Despite what my tired and mangled words may have implied, they were never intended to suggest any sort of narrow-mindedness and should never have been made." 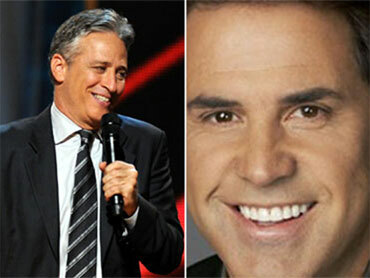 Rick Sanchez: Comments About Jon Stewart Were "Narrow-Minded"
"I take full responsibility," Sanchez said this morning. "It's not CNN. It's Rick Sanchez. Rick Sanchez screwed up." He said when he did the radio interview, "I went in there with a chip on my shoulder; I was a little bit angry." Holding up a copy of his new book, "Conventional Idiocy," Sanchez said, "We should address real issues, and sometimes I get into trouble because I confront those issues." He said he was wrong to scapegoat the comedian. "I externalized the problem and put it on Jon Stewart's shoulders. I was wrong to do that. When I called Jon Monday and said, 'Why do you always pick on me?' And he said, 'You're the one I like." The guy's been so good." He apologized personally to Jon Stewart, who he called a "bigot," and said, "I learned later that Jon Stewart is the classiest guy in the world." He said he harbored no ill-well towards his former employer, calling CNN "a wonderful, wonderful organization that treated me well." "If CNN ever takes me back, I'd be happy," he said. Stephanopolous asked where Sanchez gets the "chip on his shoulder." Holding up his book again, Sanchez told a story about when he was a little kid, growing up in a poor family in Florida. One day he'd helped his father deliver furniture, and asked a lady at a Boca Raton residence for a glass of water. She said he'd have to drink outside from a hose. When Sanchez asked his dad why he was treated that way, his father replied, "Because in America you have to become somebody to gain respect. "And that stayed with me  I feel a little challenged," Sanchez said.